Kings-1 17:8 And the word of the LORD came unto him, saying, Arise, get thee to Zarephath, which belongeth to Sidon, and dwell there: behold, I have commanded a widow woman there to sustain thee. 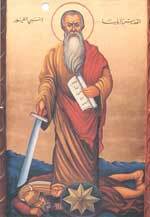 In Palestine at the time of Prophet Elijah (875 B.C.) 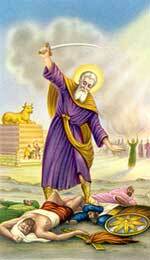 there was a king called Ahab whose wife Jezebil was of a Cananite origin who were idol worshippers at the time. So Jezebil brought the worshipping of idols into the Jewish Kingdom. Prophet Elijah was upset and went to King Ahab and told him that in the name of the God of Israel, there would be no more dew or rain. The rain stopped and rivers dried. 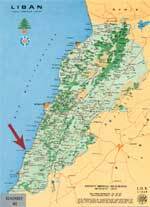 God told Elijah, go to Zarephath which belongs to Sidon (also known as Sarepta, now called Sarafand located south of Sidon) because God had ordered a widow to feed him. Prophet Elijah went to Zarephath (Sarafand) and when he reached the door of the city, he found a woman gathering sticks. Prophet Elijah asked her to give him some water and a piece of bread. The widow said “I do not have bread but a handful of flour and a little oil, and I am gathering the sticks to prepare the bread and eat it with my son and then die.” Prophet Elijah told her, don’t be afraid, go and prepare it as you said, and in the name of God, your flour and your oil shall not finish until the day God sends rain upon the earth. Later Prophet Elijah brought her child back to life in the name of God. Prophet Elijah’s Monastery in Abra ( East of Sidon) before it was demolished during the Lebanese war. It was built in the 16th century. During its history many important bishops lived in it and were buried there.